During the just concluded Mobile World Congress, nokia also announced the details of their Android phone- X and X+ that is set to be released this year, the X phone has a 4-inch, 840 x 480 IPS screen, 512MB RAM, 4GB of storage expandable storage via microSD slot and 3-megapixel camera, while the X+ has the same specs but more RAM (768MB with 4GB microSD Card. 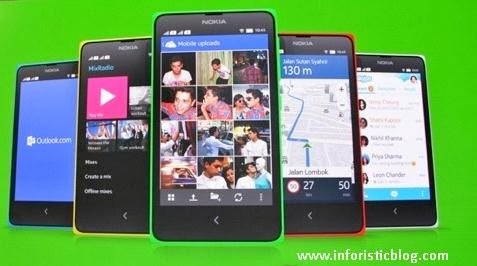 When Will The Nokia X and X+ be available? Bear in mind about some of their administrations. I for one would love to see Nokia/Ovi Maps (or as it is as of late called, Nokia HERE) on Android. Nokia's genuine force was the equipment - as well as the nature of their administrations. Their camera programming, GPS navigation, even their app store (regardless of how brief that was) was top quality. Their desktop organization app would beat even today's organization apps (well, those that are discharged, any way), and we're discussing a 5-6 year old programming here!